1. Preheat the oven to 200°C (fan 180°C/gas mark 6). 2. Cut each sweet potato in half lengthways, then cut into eight long, thin wedges and scatter over one layer on a baking tray. Drizzle over the olive oil along with a good pinch of salt, toss to mix then roast in the oven for 25 minutes. 3. Mix together the rice vinegar, sugar, red chilli, onion and cucumber in a small bowl and leave to steep, giving it a mix every now and then. 4. Coat the cod fillets in the curry paste then place onto a baking tray lined with parchment and roast in the oven for 15 minutes, by which time they should be just cooked through. When the fish has only 5 minutes to go, cut the buns in half and place in the oven to toast. 5. 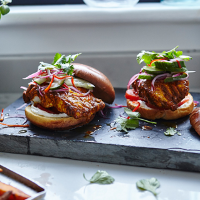 To build the burger, spread a little yoghurt onto two bun halves, load up with sliced tomato, lay the fish on top then scatter the cucumber mix over (drain off the excess vinegar). Finish with the coriander and squash the remaining bun halves on top. Serve with the sweet potato fries. * Feel free to use any type of white fish or even chicken breast instead of the cod fillets. This recipe was first published in Wed Sep 19 11:49:54 BST 2018.